Map showin the extent o the Paris metropolitan aurie at the 1999 census, when it includit 1,584 communes an covered 14,518 km². Syne then, the Paris metropolitan aurie haes absorbit 214 further communes (no shown on the map), so that bi the 2010 census it includit 1,798 communes an covered 17,174 km². 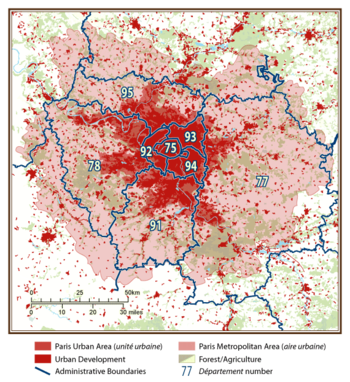 The Paris metropolitan aurie (French: aire urbaine de Paris, pronounced [ɛʁ yʁbɛn də paʁi]) is a statistical aurie that describes the reach o commuter muivement tae an frae Paris an its surroondin suburbs. Creatit bi Fraunce's national statistical office INSEE tae describe suburban development aroond centres o urban growthe, the aire urbaine is componit o a couronne périurbaine (or "rim" ) surroondin a mair densely built an densely populatit pôle urbain (or "urban cluster"), kent as unité urbaine ("urban aurie") an aw. This page wis last eeditit on 24 Mairch 2016, at 21:46.